I’d heard many good things about Bistecca Tuscan Steakhouse and had been meaning to go for some time. When we arranged to have dinner, I was having a steak craving and since my companion was indifferent to the various dining options I provided, we agreed that it would be a good time to give Bistecca a try. Bistecca Tuscan Steakhouse is among the row of shophouses next to the Temple on the main road. Most people visiting the area would park at UE Square, from which you could cut through UE or walk along Unity Road and then make a right down Mohamed Sultan Road. The restaurant will be opposite with a steep flight of steps leading to a dimly lit rustic setting with a retractable deep red outdoor shade above the entrance with the words “Bistecca”. 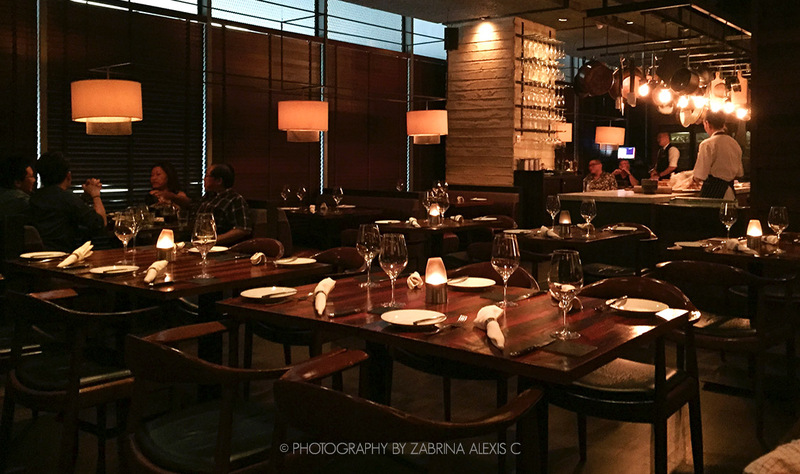 Bistecca Tuscan Steakhouse is more of an occasions kind of place. The prices are steep, but the food is lovely and service is great. If you’re going to shell out for a steak at Bistecca (and if you didn’t go alone), I suggest the Fiorentina steak ($188) – it’s the best steak I’ve tasted in Singapore thus far, and I’ve been on the hunt for the best for a while now. I might just say it’s better than Cut by Wolfgang Puck, and for a comparable price point, is on par with Wooloomooloo Steakhouse (although a direct comparison can’t be drawn since they were different cuts) and trumps Bedrock Bar & Grill. As long as you have a team of 2 or 3, take to Bistecca Tuscan Steakhouse for the Fiorentina. Good service, fantastic steak – I’ve not had a meatier, juicier, more perfectly done steak elsewhere. The 2 of us could barely finish the Fiorentina and were majorly stuffed, so if your team is a group of eaters with moderately-sized appetites, you should do just nicely. The steak is a organic-fed wagyu-cross which is dry aged. It is then grilled over a wood-fire grill which intensifies the flavour with a slightly smoky touch. On medium, the steak was tender and still a deep pinkish red on the inside, perfectly seared on the outside without crusting, and the juices flowed out readily with each slice. Steak is challenging to photograph, and the dimly lighted interiors didn’t help my mission, so go- see (and taste) for yourself. The side dishes were good too, although quite pricey. 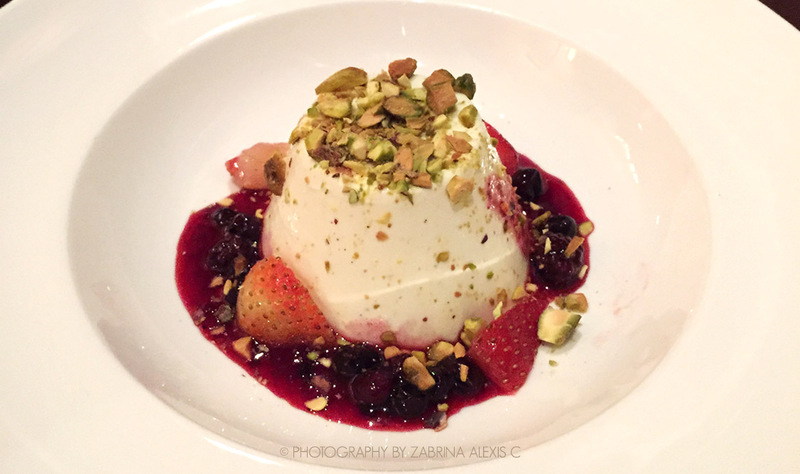 For dessert, we had a Panna Cotta which was soft and creamy, but you could probably find similar desserts elsewhere. Wanting to have a good steak, a friend asked if we should go to Bistecca Tuscan Steakhouse and Restaurant or Bedrock Bar & Grill. Since I’ve been to Bistecca and not the latter, we decided to give Bedrock a shot and met up for dinner there on a Tuesday night. The entrance to Bedrock Bar & Grill is along the alley right outside the glass doors of Somerset 313, right next to Marché, and will be the first restaurant to your left. Steak with prices in the region of Bistecca’s (ex. the Fiorentina steak, $188) and just a tier under Morton’s and Cut by Wolfgang Puck, it is needless to say that I was expecting a really good steak. With a starter and side dish to share, the meal came up to about $120 per head. Prepare for about $160 if you throw in a glass of red and a dessert as well. It was good but for the price, I was not sufficiently wowed. Service was great – attentive and pro-active with the recommendations – and the ambience is cosy and romantic with comfortable booth seating at the periphery, with just the right amount of space to lend a comfortable level of chatter from guests and yet maintain privacy. There are two private dining rooms at the back as well, which can seat about 8 persons each, at which you can host a small private dinner if you so wish. In my opinion, Wooloomooloo Steakhouse is better value, equally cosy, and with equally fantastic service. I visited Bedrock Bar & Grill on a Tuesday evening after work. From the outside, it doesn’t look like much – the front of the restaurant is modest with a narrow reception and entrance. Following the front of house down a softly lit corridor, I found that it opened up into a comfortable space with a cosy setting of lacquer and dark brown wood, kept slightly more relaxed with the filament lamps suspended over the bar in an intentionally unintentional manner, like a man rolling up the sleeves of his carefully ironed shirt. When we entered at around 7.30pm, it was about 30% full, but by the time we left at around 9.30pm, it was packed to about 75%. Heading back out again, I noticed that the high stools which were unoccupied when we entered now had a few groups of people enjoying a drink or two. It is a steakhouse, so steak is what we had. I had the Bedrock Pepper Steak (300gm ribeye, $79; featured picture) which our host mentioned was Bedrock’s signature steak and had been very well received by guests on the whole. I asked for it on medium and instead of going with the default black peppercorn sauce, chose the wholegrain whiskey mustard sauce to go with. My dining companion had the same, except on rare and with the classic béarnaise. The steaks all come with a single sauce, and if you’d like, you could swap the default sauce for another or add on any of the available sauces at $4. To begin, we shared the Caesar Salad ($22) which was one of two recommendations for starters, the other being the Bedrock Smoked Tomato Soup ($16). This, to be honest, I wasn’t at all impressed with. The baby cos was fresh, as was to be expected, but the egg was ordinary and the bacon was too hard and its presence, sparse. I couldn’t find the white anchovies which the dish’s description made mention of, except for the single good-sized one atop. The steak was served in a typical old-fashion style on a sizzling iron hotplate. My steak was cooked to a good medium, was rather tender and kept its juices. However, for some reason, I was just not quite blown away. It was good steak and cooked well, no doubt, but in terms of flavour, there was nothing very special about it, even when supported by the special sauces – both of which I tasted. In my mind I just couldn’t help but compare it to Bistecca – which I’ll readily admit wasn’t the fairest comparison given that I’d only tried their $188 Fiorentina made from a Wagyu F1 t-bone (serves 2-3 persons), although they also have steak options in the $70 – $90 range of a comparable portion size – which had a finer grain and smoother texture than the one at Bedrock. I’ve heard many good things about duck fat, and I once had a friend aspiring to be a chef who’d asked me to hand-carry a jar of it back for her from London, and so when we were looking at the sides, the duck fat potatoes ($16) were really calling out to me. I’m not sure what exactly it’s supposed to taste like, but I knew the duck fat flavour when I tasted it and was trace. We both agreed that the potatoes tasted somewhat ordinary, so I would advise to go with perhaps the creamed spinach ($18) as a side should you visit. Or, if you’re dying to have some potatoes, I’d think the Ash roasted sweet potato with bacon & blue cheese ($16) is going to be a little more special. 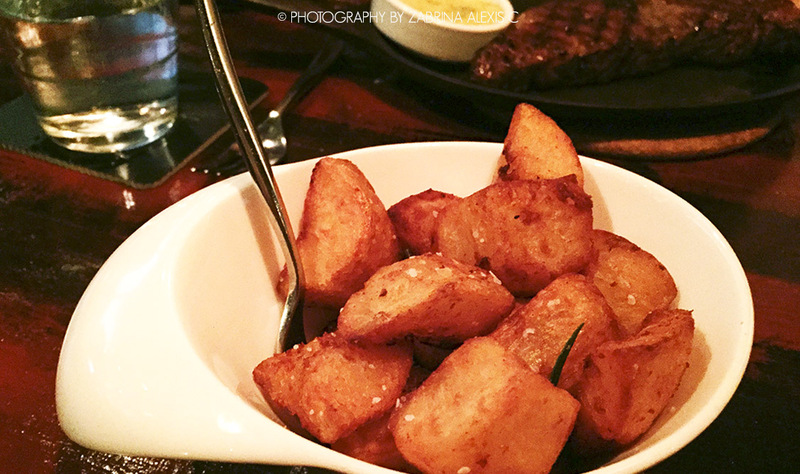 I visited Wooloomooloo Steakhouse when they first opened in Singapore, and I’ve gone back (and have been wanting to go back) at every opportunity. Wooloomooloo Steakhouse has a cosy spot in my book as a place that serves a great steak, is cosy (yet comfortable enough and not overly pretentious), and good to go with friends, family, and even that special someone. Wooloomooloo Steakhouse is tucked at a corner, just behind the escalators leading up to the conference venues, on level 3. You’ll be led from the entrance past chillers displaying a variety of wine and a classically-furnished bar area (think cigars and men in top hats) into the restaurant, which is surprisingly larger than it appears from the outside. They’re reasonable (by that I mean around 70 bucks for an Australian Black Angus Beef 12-oz Rib Eye or Sirloin). If you don’t feel like spending a bomb, I’d pick them over CUT by Wolfgang Puck or Morton’s. In this price range, they trumph Bedrock Bar & Grill, and are comparable to Bistecca Tuscan Steakhouse, although I’d go to the latter just for the Fiorentina. Christmas time is actually a really good time to go to Wooloomooloo Steakhouse. They usually have a very comprehensive 4-course Christmas menu for $68++ at lunchtime, including a steak option for the mains. The rest of the menu is fixed. For people who can’t eat a whole lot, a set menu makes more sense as well. As for the rest of the lucky ones with bottomless pits for stomachs, by all means, feast and be merry! The ambience by day is comfortable, cosy, with light coming in from the full length windows, and with views of the Padang. By night, the place seems to transform into a warm, rustic and charming atmosphere, with gentle lighting illuminating the dark wood. The bread that opened our meal was an onion bun which was served warm. The bun was soft, yet with a thin outer layer that provided a bit of bite, while the inside was fluffy and moist. I loved the onions atop, which was well complemented by the sea salt butter, although I thought some of the flavour could have been better kept at the edges which had been heated out a little too much. The cream of pumpkin soup was next – creamy and flavourful. The highlight of this dish, however, was really the foie gras which was seared to perfection. Many places overcook foie gras, but this one wasn’t; the searing brought out the intensity of the flavour on the outside, while the inside remained soft and almost tofu-like. The appetiser was a smoked salmon dish on some cream cheese and topped with mint leaves. I thought this was an excellent choice, being light and full of fresh bright flavours, and really set the stage for the heavier (and meatier) mains and creaminess of the dessert to follow. I am personally not a fan of smoked salmon because I find it tends to be rather salty, but this was quite alright even for me. The steak, oh the steak, was really my favourite part of the meal – as it should be, considering it is after all a steakhouse. It was a true medium, springy and still red through the middle, was tender through and kept its juices. The brown gravy brought out the meat’s woody notes, and the mash on the side was pureed into a cream. The dessert was a Christmastime special of fruitcake, seated in a moat of a creamy vanilla sauce, topped with vanilla ice cream and a caramelised thin. I wasn’t a fan of the fruitcake (nor of most fruitcakes for that matter) because it was quite hard and the flavours were too synthetic and gummy for my liking, although the ice cream was fine. The coffee that came later was a great way to finish the meal and cleanse the palate though – strong and full-bodied with a mild bitter finish, accompanied with a little chocolate truffle cube.